Cindi Kaplin of Simply Invitations and Events is very excited to have teamed up with Alexis and Diane of Glitter Events. Their combined talents and expertise will continue to serve the New Jersey area, creating fun and beautiful events not to be forgotten. Simply Invitations started in 2000 as an invitation company, creating custom designs to suit anyone’s wants and needs. When it comes to invitations, Cindi sets no limits, and offers a tremendous selection of papers and fabrics to choose from, as well as hundreds of different typestyles and calligraphy to create any look you desire. She has since expanded her services to include decor, favors, candlelighting displays, and much more. WE PRIDE OURSELVES ON BUILDING RELATIONSHIPS, AND OUR GREATEST COMPLIMENT IS WHEN A CLIENT SAYS: YOU MAKE ME FEEL LIKE I’M YOUR ONLY CUSTOMER. Diane graduated in 1966 from the Fashion Institute of Technology in New York City, and worked as a lingerie fashion designer throughout her early career. In 1992, Diane began planning Alexis’ Bat Mitzvah. She walked into a party-planning store to plan the big event, and walked out with a job! She worked there for 2 1/2 years, learning the business and developing her unique style. Finally, Diane decided to try it on her own. With just her dining room table for space and creative mind for inspiration, she formed The Glitter Connection. At first she booked events through friends and family – people who knew of Diane’s artistic abilities, trustworthiness, and reliability. Then word began to spread, and The Glitter Connection’s business took off. As a teenager, Alexis loved helping her mom with the business. In 2001, Alexis graduated from Lehigh University with a Bachelor of Arts in Journalism. She went on to work as an editor in the pharmaceutical internet/advertising industries. Although she enjoyed her editorial roles, she felt she was not channeling her inner creativity in the healthcare-professional market. 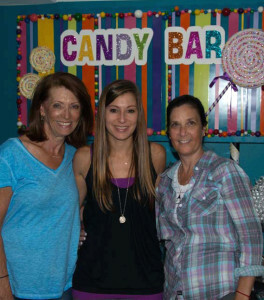 After some time, she partnered with Diane in The Glitter Connection, expanding the business even further. In June of 2013, Diane and Alexis decided to “rebrand” their business, including a fresh new name: Glitter Events. Now (in 2015) they are thrilled to be joining forces with Cindi of Simply Invitations and Decor! WE BELIEVE WHOLEHEARTEDLY IN LISTENING TO OUR CLIENTS; THIS IS WHAT ENABLES US TO COME UP WITH CREATIVE IDEAS AND BRING THEM TO LIFE. It is not surprising that Alexis, Diane and Cindi have formed friendships with many of their clients, as most will testify how comfortable they feel working with this team. Simply Invitations and Events, featuring Glitter Events, is based in Marlboro, New Jersey. © 2018 GLITTER EVENTS LLC. ALL RIGHTS RESERVED.